Natural Gas Flow Measurement – In Venezuela. Hoffer Flow Controls supplied two computerized natural gas turbine flow measuring systems to Venezuela’s gas industry. 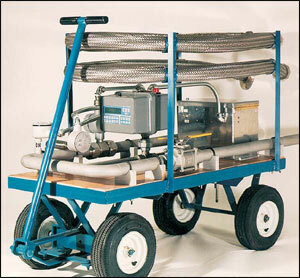 These systems accurately measure “mass” flow rate and total. Venezuela has enormous gas resources and measuring it accurately is critical because of its value. In one basin alone, there are approximately 3000 wells that require regular flow rate and flow total verification. The two units, one for low to medium flow and one for medium to high flow were designed and engineered to be mobile and to measure standard cubic feet per day. Connected at the well head atmospheric discharge, this sophisticated turbine gas flow computer performs temperature and pressure compensation and is accurate to ± 2%. Repeatability is ± 0.25% over the repeatable flow range. Each mobile unit has two turbine flowmeters and a flow computer to measure the changing extended flow rates between well heads. Operated on a 24 volt rechargeable battery system, the operator can independently move from location to location. Each computer system is equipped with an RS232 communication port and Windows compatible software. This enables the operator to download his flow information from each well to a laptop computer for ongoing well performance reports. Despite the fact that new construction materials and design changes have improved turbine flowmeter performance, the most significant changes can be found in computerization. This has truly made a difference in creating a high accuracy flow measuring system.